13th/14th c, Sophora (Huai) wood, Shanxi. Distinguish for age and rare extinct wood that never warps; beautiful deep carving. 46″ L, 20.25″ W, 33.25″ H.
Sophora or “Huai” as the Chinese knows it is a rare extinct wood. Read about it in our “About Chinese Furniture” heading. This table is not only rare because of its age, it is made of Sophora, a wood extinct after the Ming period. It exhibits an early period traditional vernacular style, with high relief carvings of figures in Song-style clothing standing among thick floral background. 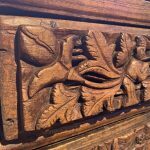 It is constructed in the traditional mitered, mortise-and-tenon method, with the tenons penetrating through to the surface. This is an early construction technique prior to the development of more sophisticated joinery. The top is made with a thick rugged piece of Sophora, with a floating panel in the middle. This top panel overhangs the main body of the chest considerably but does not have the usual spandrel decoration under each end. 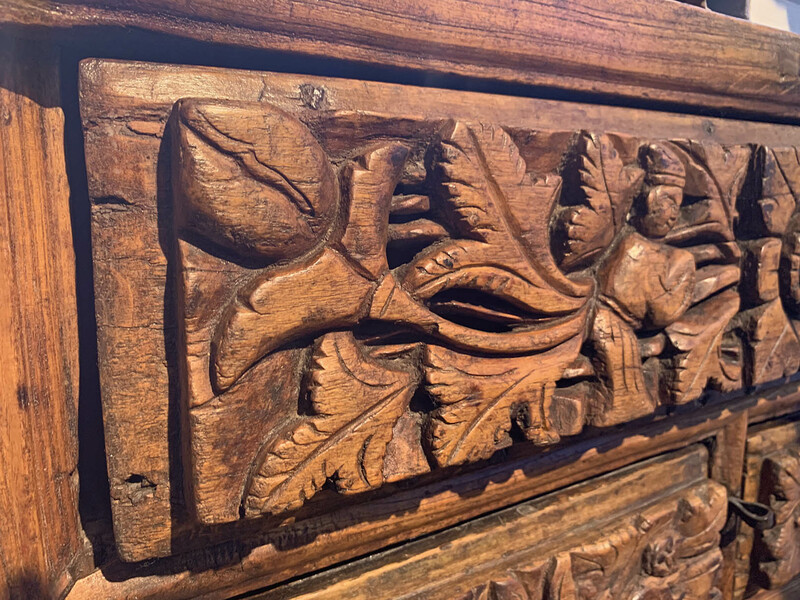 Below the top plank is a long ornately deep-carved drawer under which are two smaller deep carved ones. The long drawer has deep carving of two official-looking figures in Song style clothing, standing among thick floral background. In the center is raised-relief carving of a rosette where a brass ring is used as drawer pull. 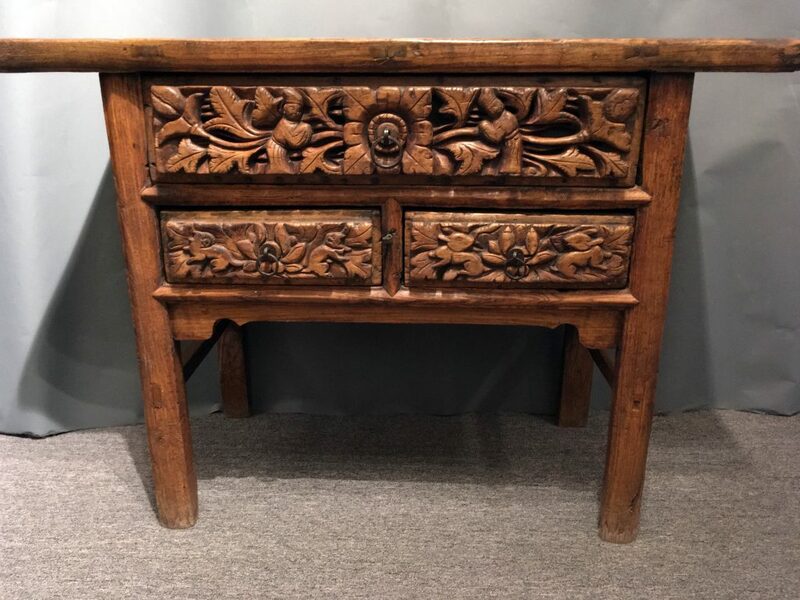 One of the drawers below has high-relief carving of a pair of rabbits, a symbol long associated with fertility, and the other drawer having carvings of a pair of Chi-lions or Fu-dogs, symbol of happy blessings as well as auspicious symbolic protection for the premise. Together, these auspicious symbols suggest the traditional family wish for longevity and increase of wealth through successive generations. The drawer-pull on each of these drawers is an original brass ring fitted through an old brass coin that act as an escutcheon plate. These drawers are separated by secondary frame members shaped with sharp beaded “sword ridge moldings”. A plain apron is below the drawers. The side and back panels on this table are strengthened by double stretchers. 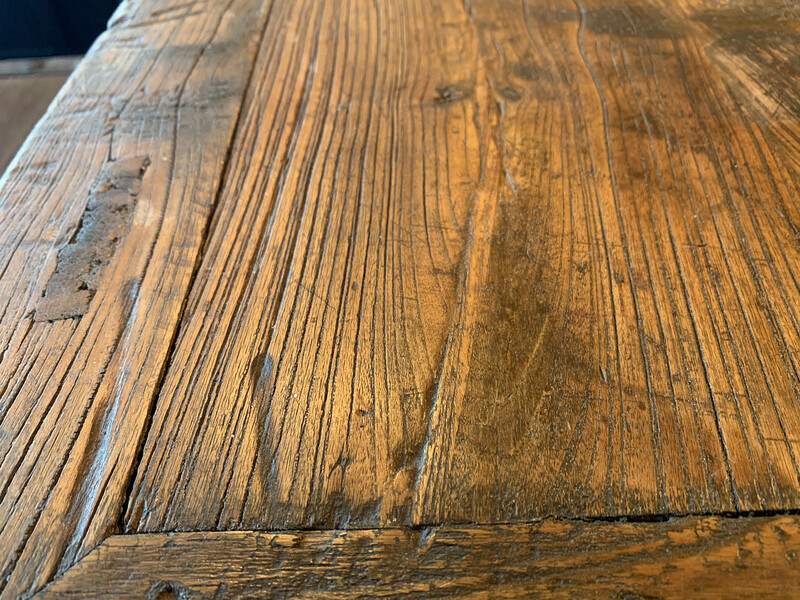 This aged table survived in excellent condition no doubt due to its dense and strong building material. 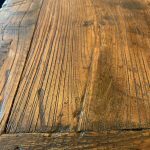 There is a burn mark near the front edge of the table top, which suggests that the table, other than being used as dining table, might at times be used for ancestral or religious worship. It also gives testimony to the antiquity of the piece. It is important for an antique piece to have evidence it has lived and has been well used.